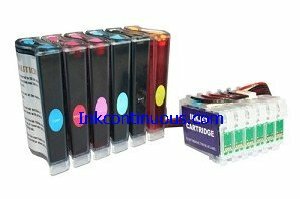 This continuous ink system is specially designed for Epson Stylus Photo R280, R595, RX680 printers that use the 78 cartridges: T0781 black ink cartridge, T0782 cyan, T0783 magenta, T0784 yellow, T0785 light cyan and T0786 light magenta cartridge. Auto reset chips are used, so you do not need to reset the chips manually. Throw away costly replacement cartridges! Save money with the Continuous Ink Supply System! 1. No more Ink Cartridge purchase, No more Cartridge replacement. Refillable ink tanks allow countless refill. 4. The ink can be pre-filled. True system ready for "Plug & Play". 5. If you run out of ink, you will only need to buy the refill ink for this system. simply pour the ink refills into the reservoirs. 6. This system does not require chips reset nor remove them from printer to get the chips reset. home | About | Privacy | Email | Products | Shopping CartCopyright 2018 InkContinuous.com All Rights Reserved.